is located at the self-managed Navarinou Park. Support us in making it bigger. Unterstützt uns ihn zu erweitern. se encuentra en el Parque de Navarinou. Apóyenos en hacerlo más grande. In the heart of Exarchia, the self-managed Parko Navarinou breathes, plays, creates and dreams. Instead of monopolising ownership of the space, the Park gives priority to the commons and satisfies a specific social need: the existence of open public spaces for gathering and recreation. 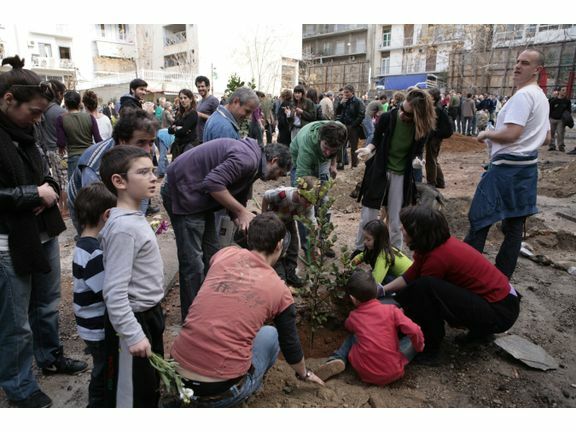 In an abandoned parking lot we planted trees, made a garden, created a space for political and cultural events and built a children’s playground. Although small, this has now become the only playground in Exarchia. After a decade of intense teamwork, and defiance of misery and decadence, the Park takes on a new form. The neighbourdhood's parents are organizing themselves and becoming active: taking care of the site, making toys and coordinating children’s events. Throughout the history of the Park as an open place of coming together and creating together, the children’s playground has become a model of social self-management. The uses of the Park will not exclude anyone. It will remain open to parents, grandparents and children from toddlers to teenagers, while at the same time we will expand the space’s multiple functions for its common use by the neighbourhood and beyond. To do this, we need your help. If there is one thing that motivates us to move forward, it is the impact of our endeavour not only in theory but in practice: in the constructive transformation of behaviours, awarenesses, practices and everyday lives. It is up to us to seize the new opportunities that open up before us. If we ourselves do not struggle to create the utopias we imagine, they will never exist. Please support us in this endeavour. 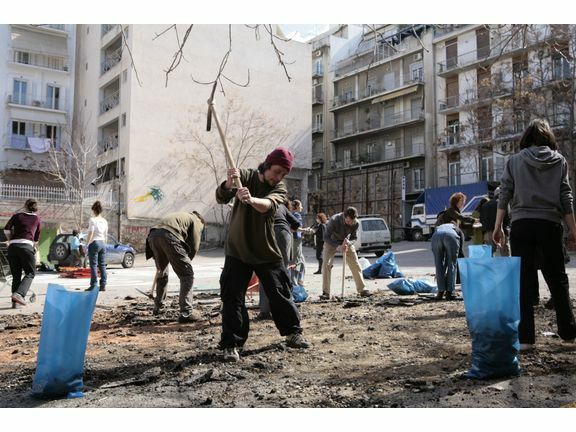 The self-managed Parko Navarinou came to be on 7 March 2009 when hundreds of people living in Exarchia and in other neighbourhoods occupied a former parking lot owned by the TCG (Technical Chamber of Greece), and turned it into a green space and a space for playing games and meeting up. Since then, the Park has encompassed multiple functions: a vegetable garden, a children’s playground and a place for movie screenings, discussions and other events. 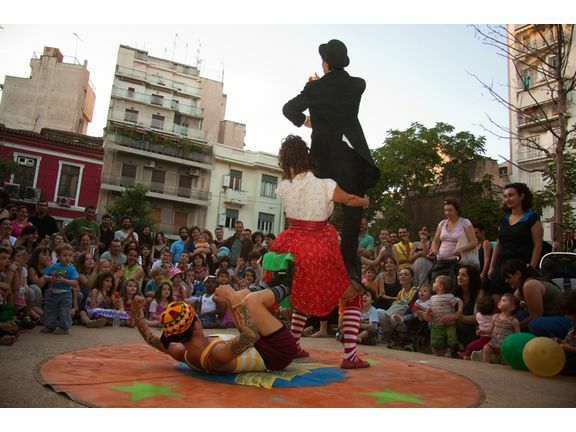 The Park was and remains the outcome of decisions made by an open assembly which comprises residents from the neighbourhood and other parts of Athens. Since inception it has been based on the collective work and contribution of those participating. It has kept clear from governmental, municipal and private organisations, and its conditions of operation are collectively configured by the participants. As an endeavour, it follows on from the wider dynamic that social self-management gained in Greece during the uprising of December 2008. During this uprising, many people took it to the streets not only to protest against the murder of Alexandros Grigoropoulos, but also to seek ways to communicate, and to comprehend and give answers to all that was happening. New group initiatives and self-managed structures emerged, and a plethora of undertakings were realised: soup kitchens, political squats, recovery of public spaces (Park at Kiprou and Patision streets) etc. The Park articulates clearly the need to retake control over our lives and everyday, as well as our space and time, and to do so in anti-commercial, anti-hierarchical and unmediated terms. Against the monopolised ownership of space, the Park counterposes the collective and horizontal structuring of the city and the right to the commons, and satisfies a specific social need: the existence of open public spaces for gathering and recreation. In a metropolis that has been literally pillaged by urban “development” and all kinds of profit-driven enterprises, the Park is actualised based on direct democratic decision-making and collective effort, in contrast to the mentality of assigning responsibilities and tasks over to “experts” and “agents”. Against all odds, the Parko Navarinou has already a decade of life behind it. Today however, we are called to operate in a completely different environment. Ten years after the creation of the Park, the neighbourhood of Exarchia finds itself at the brim of decay, running the risk of becoming a ghetto. Such conditions breed practices of authoritarian violence of those perceived to be stronger against those deemed to be weaker, and give rise to phenomena of social cannibalism. Anti-social, criminal behaviours that used to be unthinkable (shootings, the bullying of residents, constant break-ins to shops, assaults against people identifying as gay and trans, lynchings of inconceivable brutality) have now become part of our everyday lives. In all the streets of Exarchia without exception, the buying and selling of illegal substances thrives, attracting its clientele from across Attica, yielding tremendous profit and enabling the narco-mafias to claim complete control over public space. At the same time, more and more residents are forced to leave their homes which are immediately transformed into short-term lettings offered up to “first-world” tourists who seek the exploits of this peculiar “urban experience” of Exarchia. Despite this bleak reality, and thanks to the determination and commitment of those involved, the Park has managed to remain a space in common use that is highly regarded by residents and collectives, and gives them hope. What is more, something great is happening here the past year. 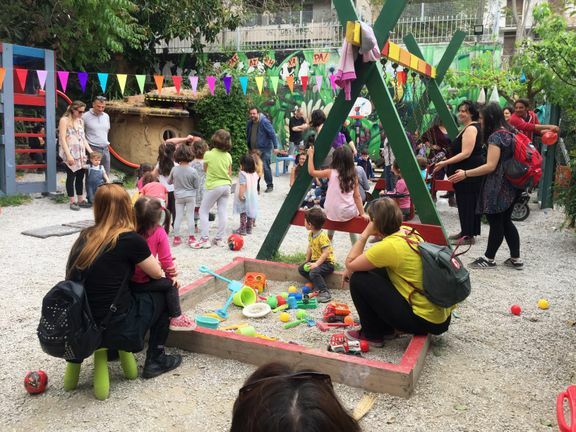 The existing children’s playground, which currently occupies only a small part of the park, has become the only playground in Exarchia. After years of hard work making, organising and running it, and given the sad fact that the rest of the neighbourhood’s playgrounds have been destroyed or abandoned, the Park’s playground is now regarded as primary outlet for the commanding social need of children, mums and dads to have access to a welcoming common space. There is, however, something greater. The neighbourhood’s parents are organising themselves and assume responsibilities for running and maintaining the playground. A wider public becomes aware and involved, makes sure that the place is kept clean and well-lit, constructs and repairs toys, and coordinates (children’s) events. The Children’s Playground of Parko Navarinou has now become an exemplar of social self-management and a model for urban spatial planning in the area. Beyond every expectation and scepticism, the Park successfully showcases new forms of communication and socialisation, incorporates people from the neighbourhood and gives tangible answers to real needs. 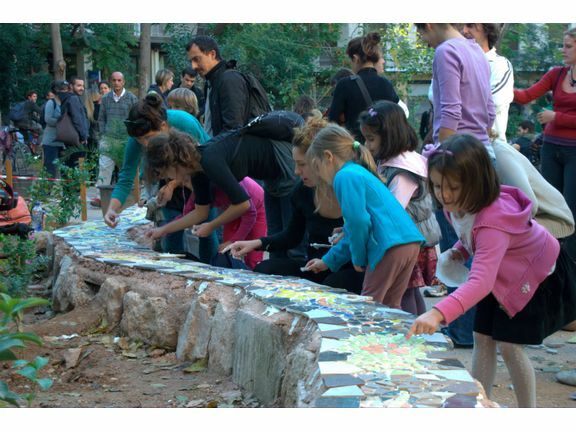 This extraordinary momentum and the positive impact on Exarchia inspire us to transform the Park into a Big Playground. Its uses will not exclude anyone. It will remain open to parents, grandparents and children from toddlers to teenagers, while at the same time we will expand the Park’s multiple functions for its common use by the neighbourhood and beyond. As a place to play and to hold events and concerts, as a site where one can grow plants, read, play sports and meet up, or simply as a welcoming green space, the Big Playground will remain open to every use that doesn’t exclude other uses. This initiative has already been embraced by many people in Exarchia, and not only here. It is, however, a new challenge for all of us. We live in a period of quashed social mobilisation, overall disappointment, resignation and social degradation. We are here today after immense efforts and constant struggle. If there is one thing that motivates us to move forward, it is the impact of our undertaking not only in theory but in practice: in the constructive transformation of behaviours, awarenesses, practices and everyday lives. It is up to us to seize the new opportunities that open up before us. Το Αυτοδιαχειριζόμενο Πάρκο Ναυαρίνου γεννήθηκε στις 7 Μαρτίου 2009 όταν εκατοντάδες κάτοικοι των Εξαρχείων και άλλων γειτονιών κατέλαβαν το πρώην πάρκινγκ ιδιοκτησίας ΤΕΕ (Τεχνικό Επιμελητήριο Ελλάδας) και το μετέτρεψαν σε χώρο πρασίνου, παιχνιδιού και συνάντησης. Από τότε ο χώρος απέκτησε ποικίλες χρήσεις: περιβόλι, παιδική χαρά, χώρος κινηματογραφικών προβολών, συζητήσεων και εκδηλώσεων. Το Πάρκο είναι αποτέλεσμα απόφασης ανοιχτής συνέλευσης των κατοίκων της γειτονιάς και άλλων περιοχών της Αθήνας. Βασίστηκε εξ αρχής στη συλλογική εργασία και συνεισφορά των συμμετεχόντων. Έμεινε μακριά από κρατικούς, δημοτικούς ή ιδιωτικούς φορείς, και οι όροι λειτουργίας του συν-διαμορφώνονται από τους συμμετέχοντες. Σαν εγχείρημα αποτελεί συνέχεια της γενικότερης δυναμικής κοινωνικής αυτοοργάνωσης που εκδηλώθηκε κατά την εξέγερση του Δεκέμβρη 2008. Στη διάρκεια της εξέγερσης, πολύς κόσμος βγήκε στους δρόμους όχι απλώς για να διαμαρτυρηθεί για τη δολοφονία του Αλέξανδρου Γρηγορόπουλου, αλλά και για να αναζητήσει τρόπους επικοινωνίας, κατανόησης καθώς και απαντήσεις σε όλα όσα συνέβαιναν. Νέες συλλογικές πρωτοβουλίες και αυτοοργανωμένες δομές προέκυψαν και δημιούργησαν πληθώρα εγχειρημάτων: κοινωνικές κουζίνες, πολιτικές καταλήψεις, επανάκτηση δημόσιων χώρων (πάρκο Κύπρου) κλπ. Το Πάρκο εκφράζει με σαφήνεια την ανάγκη να επαναοικειοποιηθούμε τη ζωή και την καθημερινότητα μας, καθώς και τον τόπο και χρόνο μας, με όρους αντιεμπορευματικούς, αντιιεραρχικούς και αδιαμεσολάβητους. Αντί της ιδιοκτησίας του χώρου, το Πάρκο προτάσσει τη συλλογική, οριζόντια δημιουργία της πόλης και το δικαίωμα συμμετοχής στα κοινά, και εξυπηρετεί μια συγκεκριμένη κοινωνική ανάγκη: την ύπαρξη ανοικτών κοινόχρηστων χώρων συνάντησης και αναψυχής. Σε μια μητρόπολη η οποία έχει κυριολεκτικά λεηλατηθεί από την οικιστική «ανάπτυξη» και πάσης φύσεως κερδοσκοπικές δραστηριότητες, το Πάρκο υλοποιείται με αμεσο-δημοκρατική διαβούλευση και συλλογική δουλειά μακριά από κάθε λογική ανάθεσης σε «ειδικούς» και «φορείς». Σε αντίθεση με όλες τις προβλέψεις, το Πάρκο Ναυαρίνου έχει διανύσει ήδη μια δεκαετία ζωής. Σήμερα ωστόσο, καλούμαστε να λειτουργήσουμε σε ένα ολότελα διαφορετικό περιβάλλον. Δέκα χρόνια μετά, τα Εξάρχεια βρίσκονται σε μια οριακή συνθήκη παρακμής και γκεττοποίησης που αναπαράγει διαρκώς πρακτικές εξουσιαστικής βίας του δυνατού απέναντι στον αδύναμο, καθώς και φαινόμενα κοινωνικού κανιβαλισμού. Αντικοινωνικές, εγκληματικές συμπεριφορές που παλιότερα ήταν αδιανόητες (πυροβολισμοί, τραμπουκισμοί εις βάρος των κατοίκων, συνεχείς ληστείες μικρομάγαζων, επιθέσεις εναντίον ομοφυλόφιλων και τρανς, λιντσαρίσματα αδιανόητης αγριότητας) αποτελούν πλέον μέρος της καθημερινότητας μας. Σε όλους ανεξαιρέτως τους πεζόδρομους των Εξαρχείων, η κύρια δραστηριότητα είναι το εμπόριο απαγορευμένων ουσιών που προσελκύει πελατεία από όλη την Αττική κάνοντας τεράστιους τζίρους και επιτρέποντας στις ναρκομαφίες να αξιώνουν την απόλυτη κυριαρχία στο δημόσιο χώρο. Ταυτόχρονα, όλο και περισσότεροι κάτοικοι υποχρεώνονται να εγκαταλείψουν τα σπίτια τους που μετατρέπονται αμέσως σε καταλύματα βραχυχρόνιας μίσθωσης, υποδεχόμενα πρωτοκοσμικούς τουρίστες που αναζητούν την περιπέτεια αυτής της ιδιόμορφης «αστικής εμπειρίας» των Εξαρχείων. Στο πλαίσιο αυτό, και χάρη στην αυταπάρνηση των συμμετεχόντων του, το Πάρκο έχει καταφέρει να αποτελέσει εκείνο τον κοινόχρηστο χώρο που διατηρεί ακόμα την εκτίμηση και την ελπίδα των κατοίκων και των συλλογικοτήτων. Επιπλέον, τον τελευταίο χρόνο συμβαίνει εδώ κάτι σημαντικό. Η υφιστάμενη παιδική χαρά, η οποία επί του παρόντος καταλαμβάνει ένα μικρό τμήμα του Πάρκου, έχει καταστεί η μοναδική παιδική χαρά των Εξαρχείων. Οι κόποι χρόνων για τη δημιουργία, συντήρηση και λειτουργία της, καθώς και το θλιβερό γεγονός πως όλοι οι υπόλοιποι παιδότοποι της περιοχής έχουν καταστραφεί ή εγκαταλειφθεί, την έχουν αναδείξει ως διέξοδο κάλυψης της επιτακτικής κοινωνικής ανάγκης παιδιών, μαμάδων και μπαμπάδων να έχουν ένα χώρο κοινό και οικείο. Υπάρχει όμως κάτι σημαντικότερο. Οι ίδιοι οι γονείς της γειτονιάς οργανώνονται και αναλαμβάνουν τη διαχείριση και λειτουργία της παιδικής χαράς. Ένα ευρύτερο κοινό ευαισθητοποιείται και δραστηριοποιείται, επιμελείται την καθαριότητα και το φωτισμό του χώρου, κατασκευάζει και επιδιορθώνει παιχνίδια, και οργανώνει (παιδικές) εκδηλώσεις. Η Παιδική Χαρά του Πάρκου Ναυαρίνου αποτελεί πλέον υπόδειγμα κοινωνικής αυτοοργάνωσης και χωροταξικό παράδειγμα για την περιοχή. Πέρα από κάθε προσδοκία και σκεπτικισμό, το Πάρκο επιτυγχάνει να αναδείξει νέες μορφές επικοινωνίας και κοινωνικοποίησης, να ενσωματώσει κόσμο από τη γειτονιά και να απαντήσει έμπρακτα σε υπαρκτές ανάγκες. Ο εντυπωσιακός αυτός δυναμισμός και ο θετικός αντίκτυπος στα Εξάρχεια, μας εμπνέει να μετατρέψουμε το Πάρκο σε μια Μεγάλη Παιδική Χαρά. Η χρήση της δεν θα αποκλείει κανένα. Θα παραμένει ανοιχτή σε γονείς, παππούδες και παιδιά από νήπια μέχρι εφήβους, ενώ παράλληλα θα διευρύνουμε τις πολλαπλές λειτουργίες του χώρου προς κοινή χρήση της γειτονιάς και πάρα πέρα. Ως τόπος παιχνιδιού, εκδηλώσεων και συναυλιών, ως μέρος καλλιέργειας, διαβάσματος, αθλοπαιδιών και συνάντησης, ή απλώς ως ένας πράσινος και φιλόξενος χώρος, η Μεγάλη Παιδική Χαρά θα παραμείνει ανοιχτή σε κάθε χρήση που δεν αποκλείει άλλες χρήσεις. Η πρωτοβουλία έχει ήδη αγκαλιαστεί από πολλούς στα Εξάρχεια, και όχι μόνο. Είναι όμως, μια νέα πρόκληση για όλους και όλες μας. Ζούμε σε μια περίοδο μεγάλης κινηματικής ύφεσης, κοινωνικής απογοήτευσης, παραίτησης και παρακμής. Είμαστε εδώ που είμαστε σήμερα μετά από υπέρμετρες προσπάθειες και διαρκείς δυσκολίες. Αν κάτι μας ενθαρρύνει να πάμε μπροστά, είναι η απήχηση που έχει το εγχείρημά μας όχι στη θεωρία αλλά στην πράξη: στην έμπρακτη διαμόρφωση συμπεριφορών, συνειδήσεων, πρακτικών και καθημερινοτήτων. Είναι στο χέρι μας να αξιοποιήσουμε τις νέες προοπτικές που μας ανοίγονται. Im Herzen von Exarcheia atmet der selbstverwaltete Navarino-Park, spielt und ist kreativ. Anstelle des Monopoleigentums am Gelände ist der Park ein Projekt des Rechts an den Commons und dient einem besonderen sozialen Bedürfnis: der Existenz von öffentlichen Zusammenkunfts- und Erholungsgebieten. Auf einem verlassenen Parkplatz pflanzten wir Bäume, schufen einen Garten, bildeten einen Raum für kulturelle und politische Veranstaltungen und realisierten einen Spielplatz. Obwohl klein, ist er jetzt der einzige Spielplatz in Exarchia. Nach einem Jahrzehnt großer solidarischer Anstrengungen und gegen das Verkommen und den Verfall bekommt der Park jetzt eine neue Form. Die Eltern der Nachbarschaft sind selbst organisiert und aktiv, kümmern sich um das Gelände, bauen Spielgeräte und koordinieren Kinderveranstaltungen. In der Geschichte des Parks als offener Raum des Zusammenkommens und des gemeinsamen produktiven Schaffens ist der Spielplatz ein Modell der sozialen Selbstorganisation. Die Nutzung des Parks wird niemanden ausschließen. Er wird für Eltern, Großeltern und Kinder, von Kleinkindern bis zu Jugendlichen, offen bleiben; gleichzeitig werden die vielfältigen Funktionen des Orts zur gemeinsamen Benutzung durch die Nachbarschaft und darüber hinaus erweitert. Aber um das zu erreichen, brauchen wir deine Hilfe. Wenn etwas uns ermutigt, damit voran zu gehen, so ist es die Resonanz, die unser Projekt nicht in der Theorie, sondern in der Praxis erfährt: in der praktischen Bildung von Verhaltensweisen, Bewusstsein, Praxen und Umgang im täglichen Leben. Es liegt an uns, unsere neuen Perspektiven zu nutzen. Wenn wir uns nicht anstrengen, selbst die Utopien zu erschaffen, die wir träumen, werden sie niemals praktisch existieren. Aber um das umzusetzen, laden wir euch ein uns dabei zu unterstützen. Der Park ist das Ergebnis der Entscheidung einer offenen Versammlung von Bewohnern der Nachbarschaft und anderer Bezirke von Athen. Der Park basierte von Anfang an auf der kollektiven Arbeit sowie dem Beitrag der TeilnehmerInnen und blieb fern von staatlichen, kommunalen oder privaten Trägern; die Bedingungen seines Funktionierens wurden von den Beteiligten mit gestaltet. Als Projekt ist er eine Fortsetzung der allgemeineren Dynamik der sozialen Selbstorganisation, die während der Rebellion im Dezember 2008 entstanden ist. Während der Revolte gingen viele Menschen auf die Straße, nicht nur, um gegen den Mord an Alexandros Grigoropoulos [am 6. Dez. 2008] zu protestieren, sondern auch, um Wege der Kommunikation, des Verständnisses wie auch Antworten auf alles, was geschah, zu suchen. Neue kollektive Initiativen und selbstorganisierte Strukturen entstanden, es bildete sich eine Reihe von Projekten: soziale Küchen, politische Besetzungen, Wieder-Inbesitznahme von öffentlichen Räumen (Park an der Zypernstraße [in Kypseli]) usw. Der Park drückt deutlich die Notwendigkeit aus, uns unser Leben und unser tägliches Sein wieder anzueignen, unsere Stadt und unsere Zeit, unter anti-kommerziellen, anti-hierarchischen Bedingungen und ohne Mittelsleute. An die Stelle des Eigentums setzt der Park den kollektiven, horizontalen Aufbau der Stadt und das Recht der Teilhabe an den Commons; er dient einem bestimmten gesellschaftlichen Bedürfnis: dem nach Vorhandensein gemeinschaftlich genutzter Räume der Begegnung und der Freizeitgestaltung. In einer Metropole, die durch die bauliche „Entwicklung“ und alle Arten von spekulativen Aktivitäten buchstäblich geplündert wurde, manifestiert der Park den unmittelbar-demokratischen Ratschlag und die kollektive Arbeit, entgegen jedem Konzept der Vergabe an „Experten“ und „Träger“. Im Gegensatz zu allen Vorhersagen hat der Navarino-Park bereits ein Jahrzehnt Leben hinter sich. Heute sind wir jedoch gefordert, in einer völlig anderen Umgebung zu funktionieren. Zehn Jahre später befindet sich Exarchia ist in einem extremen Zustand des Niedergangs und der Ghettoisierung, einem Zustand, der immer wieder Praktiken autoritärer Gewalt des Stärkeren gegenüber dem Schwächeren sowie Phänomene von Sozialem Kannibalismus reproduziert. Asoziale, kriminelle Verhaltensweisen, die man früher nicht für möglich gehalten hätte (Schießereien, Pöbeleien gegen BewohnerInnen, fortwährend Raubüberfälle auf Kleinhändler, Angriffe auf Homosexuelle und Trans, Lynchen mit unvorstellbar Grausamkeit) sind inzwischen Teil unseres täglichen Lebens geworden. In ausnahmslos jeder Fußgängerzone von Exarchia ist die Haupttätigkeit der Handel mit verbotenen Substanzen, der Käufer aus ganz Attika hierher führt. Dieser Handel produziert enorme Umsätze und erlaubt damit den Narko-Mafiagruppen absolute Dominanz im öffentlichen Raum. Gleichzeitig sind mehr und mehr BewohnerInnen gezwungen, ihre Wohnungen zu verlassen, die anschließend sofort in Unterkünfte der Kurzzeit-Vermietung umgewandelt werden. Dort steigen dann Touristen aus den Industrieländern ab, die das Abenteuer dieser besonderen "Stadterfahrung" von Exarchia suchen. In diesem Zusammenhang und dank der Opfer der Teilnehmer, hat der Park es erreicht, jener selbstverwaltete Ort zu bleiben, die immer noch die Anerkennung der Bewohner und Kollektive bekommt und ihre Hoffnungen zum Ausdruck bringt. Darüber hinaus passierte hier im letzten Jahr etwas Wichtiges. Der bestehende Spielplatz, der derzeit einen kleinen Teil des Parks einnimmt, ist zum einzigen Spielplatz in Exarchia geworden. Die Arbeiten von Jahren für die Schaffung, die Instandhaltung und den Betrieb und die traurige Tatsache, dass alle anderen Spielplätze in der Umgebung zerstört oder aufgegeben worden ist, haben ihn zum Ausweg für die Befriedigung der drängenden sozialen Bedürfnisse von Kindern, Müttern und Vätern nach einem gemeinsamen und vertrauten Raum gemacht. Aber es gibt noch etwas Wichtigeres. Die Eltern in der Nachbarschaft organisieren und übernehmen selbst die Verwaltung und den Betrieb des Spielplatzes. Ein breiteres Publikum wird bewusst aktiv, kümmert sich um Sauberkeit und Beleuchtung, produziert und repariert Spielgeräte und organisiert (Kinder-) Veranstaltungen. Der Spielplatz des Navarino-Parks ist für die Region schon ein Modell der sozialen Selbstorganisation und Beispiel der Flächennutzung geworden. Über alle Erwartung und Skepsis hinaus gelingt es dem Park, neue Formen der Kommunikation und Sozialisation aufzuzeigen, Menschen aus der Nachbarschaft zu integrieren und auf konkrete tatsächliche Bedürfnisse zu antworten. Diese beeindruckende Dynamik und positive Wirkung auf Exarchia inspiriert uns, den Park zu einem großen Spielplatz auszubauen. Seine Benutzung schließt keinen aus. Er wird für Eltern, Großeltern und Kinder von Kleinkindern bis hin zu Jugendlichen offen bleiben und gleichzeitig die vielfältigen Funktionen des Orts für die Nachbarschaft und darüber hinaus erweitern. Als Ort für Spiele, Veranstaltungen und Konzerte, als Teil von Kultur, Lesen, Sport und Begegnung oder einfach als grüner und einladender Platz wird der große Spielplatz für jede Nutzung offen sein, die nicht andere Nutzungen ausschließt. Die Initiative wurde bereits von vielen in Exarchia angenommen, aber nicht nur hier. Aber es ist eine neue Herausforderung für uns alle. Wir leben in einer Zeit großer Rezession der Bewegungen, sozialer Enttäuschung, Resignation und Niedergang. Wir sind da, wo wir heute sind, nach enormen Bemühungen und ständigen Problemen. Wenn etwas uns ermutigt, voranzukommen, dann ist es die Resonanz, die unser Projekt nicht in der Theorie, sondern in der Praxis erfährt: in der praktischen Bildung von Verhaltensweisen, Bewusstsein, Praxen und Umgang im täglichen Leben. En el corazón de Exarchia, el Parque autogestionado de Navarinou respira, juega, crea y sueña. A la propiedad monopolística del espacio, el Parque antepone el derecho a los bienes comunes y responde a una concreta necesidad social: la existencia de espacios públicos y abiertos de encuentro y de ocio. 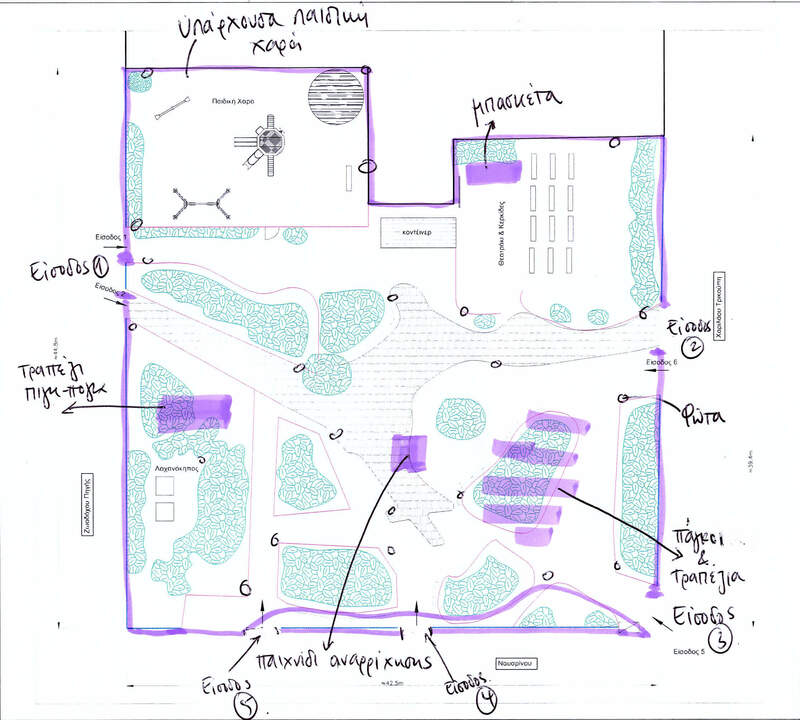 En un aparcamiento abandonado hemos plantado árboles, creado un jardín y un espacio para eventos culturales y políticos, y hemos construido un parque infantil. Aunque modesto en dimensiones, ese se quedó el único parque infantil en Exarchia. Tras una década de intenso esfuerzo solidario, y desafiando la miseria y la decadencia, el Parque está tomando una forma nueva. Los padres del barrio sí mismos se organizan y se vuelven activos, cuidan el sitio, crean juguetes y coordinan eventos infantiles. A la historia del Parque como un lugar abierto de encuentro y de co-creación se suma el parque infantil como un ejemplo de autogestión social. Si hay algo que nos anima a seguir adelante, es el impacto de nuestro proyecto no solo en teoría sino en la práctica: en la transformación constructiva de comportamientos, conciencias, prácticas y vidas cotidianas. Depende de nosotros aprovechar las oportunidades que se nos presentan. Si nosotros mismos no luchamos por crear las utopías con las que soñamos, nunca existirán. Les invitamos a que nos apoyen en esa iniciativa. El Parque autogestionado de Navarinou nació el 7 de marzo de 2009 cuando cientos de residentes del barrio ateniense de Exarchia y de otros barrios ocuparon un aparcamiento abandonado, propiedad de la CTG (Cámara Técnica de Grecia), y lo convirtieron en un espacio verde, de juegos y de encuentro. Desde entonces, el parque ha abarcado múltiples usos: huerta, parque infantil y un lugar para ver películas, hacer debates y organizar eventos. El Parque fue y sigue siendo el resultado de decisiones tomadas por una asamblea abierta de residentes del barrio y de otras partes de Atenas. Desde su inicio, se ha basado en el trabajo colectivo y la contribución de los participantes. Se mantiene independiente de agentes estatales, municipales o privadas, y sus condiciones de operación están configuradas de manera colectiva por los participantes. Como proyecto, se origina en la dinámica general que ganó la autogestión social en Grecia durante el levantamiento de diciembre de 2008. Durante este levantamiento, mucha gente salió a la calle no solo para protestar contra el asesinato de Alexandros Grigoropoulos, sino también para buscar formas de comunicarse, y para comprender y dar respuestas a todo lo que estaba sucediendo. Surgieron nuevas iniciativas colectivas y formas de autogestión, y se realizaron multitudes de iniciativas: comedores sociales, ocupaciones políticas, recuperación de espacios públicos (Parque entre las calles de Kiprou y Patision), etc. El Parque refleja con claridad la necesidad de retomar el control sobre nuestras vidas y lo cotidiano, así como sobre nuestro lugar y tiempo, y hacerlo en términos anti-comerciales, anti-jerárquicos y sin intermediarios. A la propiedad del espacio, el Parque antepone la creación colectiva y horizontal de la ciudad y el derecho a los bienes comunes, y responde a una concreta necesidad social: la existencia de espacios públicos y abiertos de encuentro y de ocio. En una metrópolis que ha sido literalmente saqueada por el “desarrollo” urbano y todo tipo de actividades con ánimo de lucro, el Parque toma forma a través de la consulta democrática directa y el trabajo colectivo, lejos de cualquier mentalidad de asignar responsabilidades y tareas a “expertos” y “agentes”. Contra todo pronóstico, el Parque de Navarinou ya ha cumplido diez años. Sin embargo, en la actualidad nos vemos obligados a operar en un entorno totalmente diferente. Diez años después de la creación del Parque, el barrio de Exarchia se encuentra al borde de la decadencia, corriendo el riesgo de convertirse en un gueto. Tales condiciones generan prácticas de violencia autoritaria por parte de los más fuertes contra los más débiles, y dan lugar a fenómenos de canibalismo social. Conductas delictivas y antisociales que antes eran impensables (disparos, acosos a los vecinos, atracos de pequeños comercios, asaltos contra personas que se identificaban como homosexuales y transexuales, linchamientos de una brutalidad inconcebible) ahora forman parte de nuestra vida cotidiana. En todas las calles de Exarchia sin ninguna excepción, la compraventa de sustancias ilegales prospera, atrayendo a su clientela de toda la región de Attica, lo que supone un lucro enorme y permite a las narco-mafias reclamar el dominio absoluto sobre el espacio público. Al mismo tiempo, son cada vez más los residentes que se ven obligados a abandonar sus hogares, para que estos últimos se transformen inmediatamente en alquileres a corto plazo para turistas del “mundo desarrollado” en busca de la aventura que supuestamente ofrece esta peculiar “experiencia urbana” de Exarchia. En este contexto, y gracias a la determinación y el compromiso de los participantes, el Parque ha logrado ser un espacio en uso común que sigue gozando del aprecio y la esperanza de los habitantes y los colectivos. Además, algo importante ha estado sucediendo aquí este último año. El parque infantil actual, que ahora ocupa una pequeña parte del parque, se ha convertido en el único parque infantil de Exarchia. Después de años de duro trabajo para crear, mantener y operarlo, y el hecho lamentable de que todos los demás parques infantiles en la zona han sido destruidos o abandonados, el parque infantil del Parque de Navarinou ya es el único medio para cubrir la necesidad social principal de los niños y de sus padres de tener acceso a un espacio común y acogedor. Pero hay algo aún más importante. Las mamás y los papás del barrio sí [email protected] se organizan y asumen la gestión y el funcionamiento del parque infantil. Un público más amplio está sensibilizándose, involucrándose y ocupándose de la limpieza y de la iluminación del parque, crea y repara juguetes y organiza eventos (para niños). 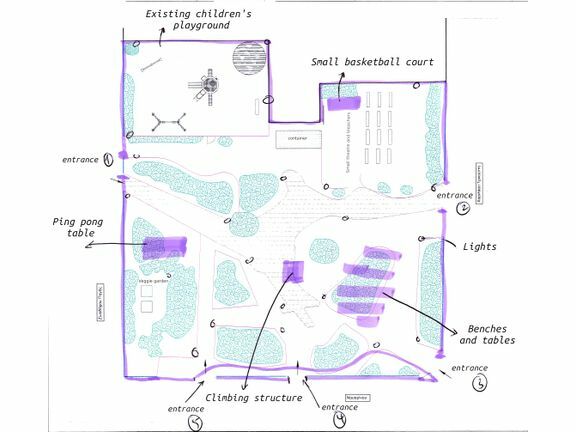 El Parque Infantil del Parque de Navarinou ya representa un modelo de autogestión social y de planificación urbana para la zona. A pesar de todas las expectativas y el escepticismo, el Parque está creando nuevas formas de comunicación y de socialización, integra la gente del barrio y brinda respuestas tangibles a necesidades reales. Este dinamismo impresionante y el impacto positivo en Exarchia nos inspiran a transformar el parque en un gran parque infantil. Todos podrán utilizar el Parque, nadie se excluye. Permanece abierto a los padres, los abuelos y los niños desde bebés hasta adolescentes, a la vez que ampliamos las múltiples funciones del espacio para su uso común en el barrio y más allá. Siendo un lugar de juego, eventos y conciertos, un sitio donde se puede cultivar plantas, leer, practicar deportes y reunirse, o simplemente como un espacio verde y acogedor, el Gran Parque Infantil permanece abierto a cualquier uso que no excluya a otros usos. Esta iniciativa ya ha sido adoptada por muchas personas en Exarchia, y no solo aquí. Sin embargo, es un nuevo desafío para [email protected] [email protected] Vivimos en un período de movilización social en declive, de desilusión general, de resignación y de decadencia. Hemos llegado hasta aquí tras un inmenso esfuerzo y una lucha constante. Si hay algo que nos anima a seguir adelante, es el impacto de nuestro proyecto no solo en teoría sino en la práctica: en la transformación constructiva de comportamientos, conciencias, prácticas y vidas cotidianas. Depende de nosotros aprovechar las oportunidades que se nos presentan. With Ether donations, all donations are instant and refunds are not currently possible. Η συνεισφορά μέσω της πιστωτικής κάρτας θα πραγματοποιηθεί μόνο αν η καμπάνια φτάσει το ποσό μέσα στο διάστημα που έχει βάλει στόχο. Ether-spenden sind zur Zeit nur als direkte Spende leistbar deswegen ist eine Erstattung nicht möglich. Sie Entscheiden der Beitragsgröße. Denken Sie bitte daran, dass FIREFUND eine non-profit von Aktivist*innen betriebene Organisation ist. Tú decides cuánto va destinado a firefund. Por favor, recuerda que firefund es una organización sin ánimo de lucro mantenida por activistas. 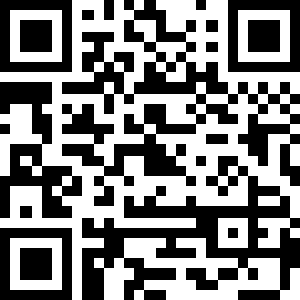 For this campaign all Ether will be transferred directly to the activists with no platform fee. Ether are not refundable at the moment. Read more about our terms. Για αυτή την καμπάνια όλο το ποσό των Ether θα μεταφερθεί απευθείας και χωρίς καμία είδους παρακράτηση από την πλατφόρμα. Οι συνεισφορές με Ether δεν επιστρέφονται. Διαβάστε περισσότερα στους'Όρους και Προϋποθέσεις. Für diese Kampagne werden alle Ether direkt an Aktivist*innen überwiesen, ohne eine Platformgebühr. Ether sind zur Zeit nicht Erstattungsfähig. Weitere informationen finden Sie unter unseren terms. En esta campaña todos los Ether serán transferidos directamente a las activistas sin cuota de plataforma. Por el momento no es posble el reembolso de Ether. Leer más sobre nuestros términos. .